The email from producer Margaret McCabe pitched the show, which would feature aspiring politicians as contestants, as being targeted for the “Apprentice meets Maria/Strictly Come Dancing audience”. The memo added that the show was “not stunt TV” and as a judge, Brown could become “more popular than Alan Sugar”. A spokesman for Blears confirmed that a reality show was in the works: “It is a very worthy programme idea. These young people would engage and have some kind of competition, and then there would be a way of electing a young prime minister for a day. 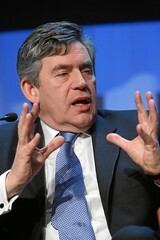 It has been documented before that Gordon Brown is a big fan of the X Factor. I think it’s interesting how Gordon Brown is such an unpopular prime minister that he now feels like he needs to be a judge in a television reality show. There will of course be worries that this show could cheapen politics. I can’t remember whether it was just an idea which was floated or an idea which actually happened in some country, but people talked about having a reality show to determine a candidate who would stand for Member of Parliament. Of course, the problem is the winner of the show has had an unfair amount of publicity and would probably easily win election based on the fact they were once on TV, regardless of whether their politics were actually any good. Anyway, the “Junior PM” project is still in the very early days so it’ll be interesting to see whether it gets any further. This entry was posted in Politics, UK by Ken. Bookmark the permalink. What an idiot. If he thinks this will make him “hip with the kids” then hes more of a goon than we’ve thought the past few months. How about doing something to help the country, than try and improve your already shattered and unfixable image?.